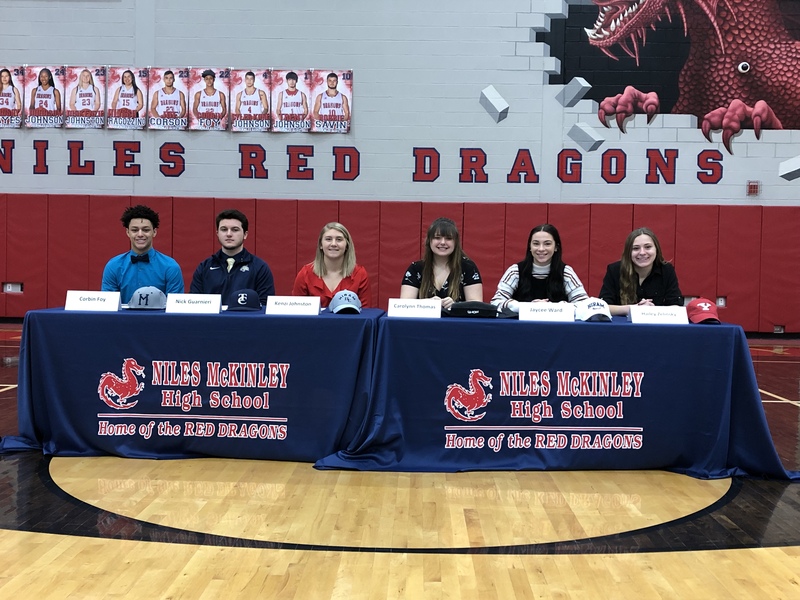 The Niles Red Dragons held their signings today for their student-athletes. We wish them all the best in their future endeavors, and thank them for allowing us to share in their big day! Good luck at the next level, Dragons. We’ll be cheering for you! Corbin Foy- Corbin is the son of Kevin and Kim Foy. Foy is a four-year letter winner in baseball and carries a 3.34 GPA. Corbin will further his academic and athletic career at Mercyhurst Northeast in the fall to study kinesiology and play baseball. Nick Guarnieri- Nick is the son of Julie and TC Guarnieri. A four-year letterman in baseball, Nick also carries a 3.51 GPA and will attend Thiel College in the fall and play baseball for the Tomcats. Kenzi Johnston- Kenzi is the daughter of Buffy and Mac. Johnston is a multi-sport athlete in soccer, basketball, and softball and carries a 3.33 GPA. Kenzi will continue her soccer and academic career at Hiram College majoring in Sports Management and Business. Carolynn Thomas- Carolynn is the daughter of Shelly Maggiano. Thomas is a four-year letter winner in bowling as well as a three-year letter winner in soccer and carries a 2.63 GPA. Carolynn will attend the University of Northwestern Ohio to bowl and study business. Jaycee Ward- Jaycee is the daughter of Shawna and Jason. Ward is a four-year letterman in soccer and carries a stellar 3.70 GPA. Jaycee will continue her soccer and academic career at Hiram College majoring in neuropsychology and psychobiology. Hailey Zelinsky- Hailey is the daughter of Chris and Marla. Zelinsky is a four-year letter winner in cross country and track and carries an incredible 4.0 GPA. Hailey will continue her cross country/track and academic career at Youngstown State University.